It is with great pleasure to invite you to join the 26th GIF Webinar, dedicated to the Safety of Gen IV Reactors, on 19 February 2019. It will be presented by Dr Luca Ammirabile, from the European Commisison’s Joint Research Centre in Petten, NL. Excellence in safety and reliability is among the goals identified in the technology roadmap for Generation IV nuclear reactors. This webinar will give an overview of the activities of the Gen IV Risk and Safety Working Group done in support of the six Gen IV nuclear energy systems towards the fulfilment of this goal. Topics include a presentation of the safety philosophy for Gen IV systems, the current safety framework for advanced reactors, and the methodology developed by the group for the safety assessment of Gen IV designs. Other ongoing activities between the group and the designers of Gen IV systems will be also highlighted. ​GEN IV International Forum is happy to announce that they are resuming their webinar series on Gen IV systems and cross-cutting subjects. Mr. Ilya Pakhomov from IPPE, Russia, will give a webinar on the operating experiance of BN600 and BN800 sodium-cooled fast reactors, on December 19th at 5:30 AM (PST); 8:30 AM (EST). Please register at the following link: https://attendee.gotowebinar.com/register/4122346564850819852. All webinars are archived and can be found at www.gen-4.org. The Nuclear Science User Facilities (NSUF) Industry Advisory Meeting is hosted by the Electric Power Research Institute (EPRI) and organized by the Department of Energy Office of Nuclear Energy (DOE-NE) NSUF program and the DOE-NE GAIN (Gateway for Accelerated Innovation in Nuclear) initiative. It is an opportunity for the nuclear power industry to find out what the NSUF is, how it can benefit the industry, and how to get involved. It is also intended to be an open forum for providing feedback to the program so that it continues to be a valuable asset to the nation. Invitees are encouraged to come prepared with questions for NSUF and GAIN and to think about how NSUF can be leveraged for their company’s benefit. 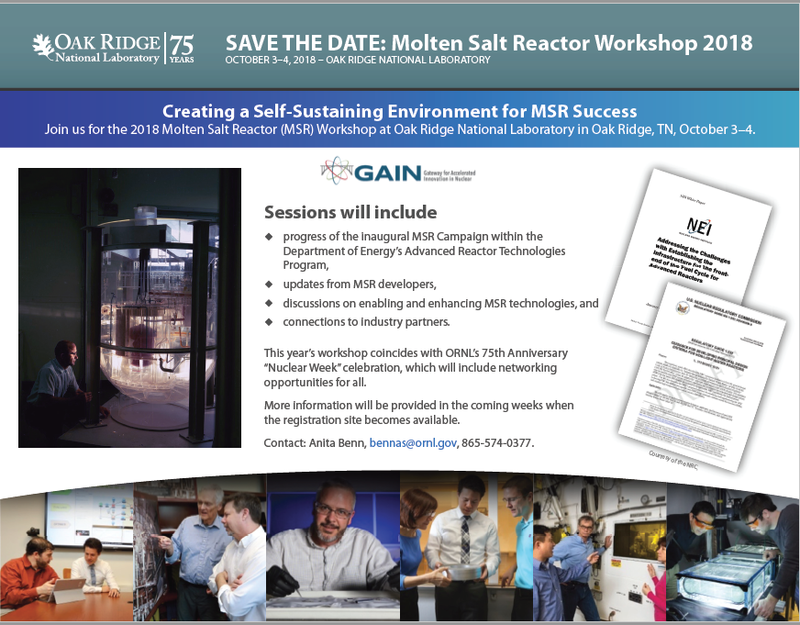 This year's workshop coincides with ORNL's 75th Anniversary "Nuclear Week" celebration, which will include networking opportunities for all. This International meeting is a broad-based meeting focused on areas of nuclear energy, engineering and science, and policy issues that accompany nuclear energy programs throughout the Pacific Rim. The meeting is sponsored by the Pacific Nuclear Council and ANS. The American Nuclear Society is excited to invite you to join us in the city of brotherly love, Philadelphia, PA from June 17-21, for the 2018 ANS Annual Meeting, which will be held at the Marriott Philadelphia Downtown. In addition to an impressive list of government and industry leaders, we are also planning several outstanding hot-topic technical sessions and popular plenary speakers, along with the Nuclear Fuels & Structural Materials for Next Generation Nuclear Reactor embedded meeting, which will attract professionals from across the nation and internationally. Please join us to gather stakeholder input related to advanced sensors, instrumentation, and proocess control technologies for advanced reactors. The USNIC Ready4Nuclear Western Nuclear Suppliers Workshop will include a platform for companies, suppliers, and innovators to present, discuss and display new and developing technology to attendees as part of the Workshop. This is your chance to showcase technology or processes that your company or organization is using or developing to key nuclear energy decision-makers within the nuclear industry. During networking times you will be able to showcase your company's products to a captive audience of industry and government influentials, allowing you to expand your reach, interact with key decision-makers, and leave with a network to move your initiatives and products forward. This is an invitation only symposium to provide a candid discussion of state of the High Temperature Reactor (HTR) technology and the prospects for, and challenges to, commercialization of HTRs. We will seek insights from energy 'thought leaders' outside the HTR community. Location: Idaho National Laboratory Meeting Center Room A102, 775 University Boulevard, Idaho Falls, Idaho. The American Nuclear Society and the U.S. Nuclear Regulatory Commission have organized a workshop for industry partners to develop a strategic vision for advanced reactors standards. The workshop will provide an opportunity for designers, vendors, owners, regulators, and representatives of standards development organizations (SDOs) to discuss standards needs to support advanced reactors. The workshop will include a brief introduction before allowing most of the time for breakout sessions to achieve the goal of developing a path forward and setting priorities for the development of standards from across all SDOs. Participants are asked to come prepared with suggestions for revising existing standards or developing new standards. There is no fee to participate in person or remotely (webinar/teleconference); however, physical attendance is strongly encouraged for optimum engagement. Registration is required by Friday, April 13, 2018.